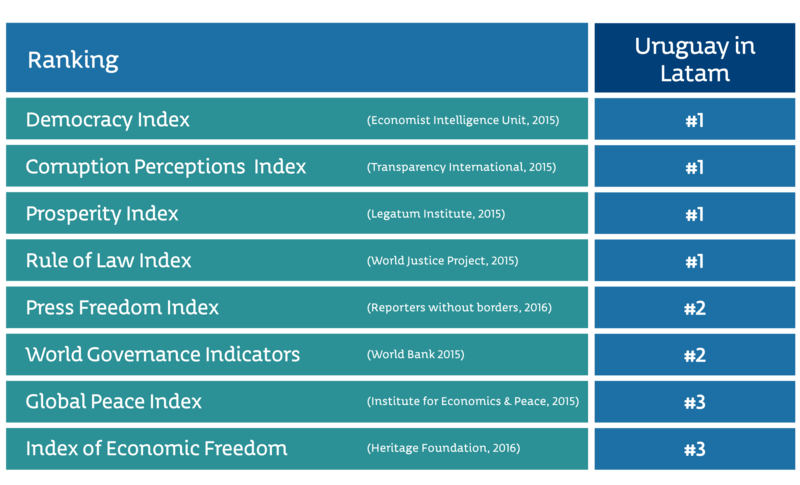 Uruguay has Investment Grade status, which shows the trust in the country’s institutional framework and the conduction of its economic system. The orderly macroeconomic management led S&P (April 2012), Moodys (July 2012) and Fitch Ratings (March 2013) to return the country to Investment Grade (IG). Uruguay is a gateway to Mercosur. 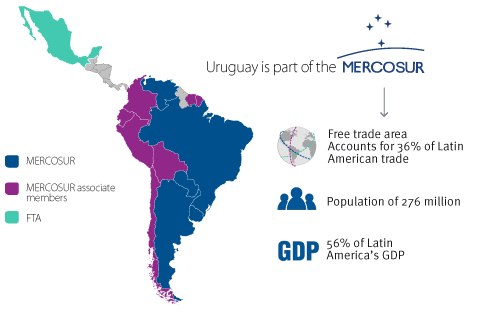 Our free access to Mercosur provides us with access to a market with over 270 million people, which accumulate 56% of Latin America's GDP. 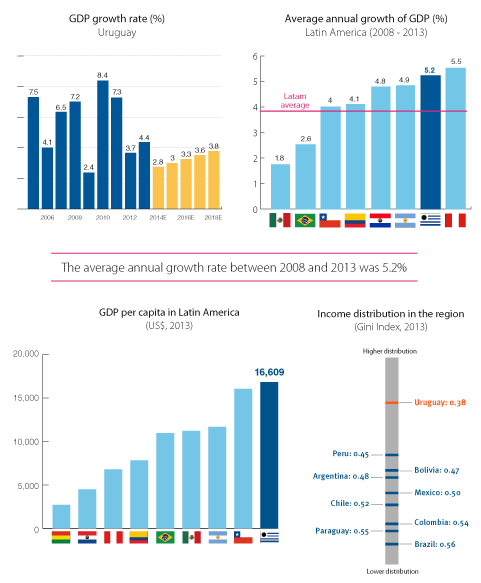 Moreover, with Mercosur and the Free Trade Agreement with Mexico, Uruguay has tariff-free access to a market of 400 million people, which signifies 76% of Latin Americ's GDP, and to a flow of foreign trade that accounts for almost 80% of Latin America's total. Uruguay is positioned as a regional logistics hub, with a remarkable location as regards the wealthiest cities in the region. The free zone, free port and airport and bonded warehouses regulations provide an ideal framework for the setting up of distribution centers to supply goods to said cities. To access Uruguay's international goods, services, state procurement, investments and double taxation agreements you can check International Agreements in our Investor Guide. FDI received by Uruguay reached US$ 2,755 million in 2014. Thus, the last decade had the strongest FDI growth in the history of the country. The IED average, which represents 5,6% of the GDP, makes Uruguay the second largest FDI recipient in South America from a GDP standpoint. 60% of foreign companies' profits were reinvested in our country in the past year. National and foreign investment in Uruguay is declared of national interest by law. Thus, foreign investors are granted the same incentives as local investors and there is no tax discrimination in favor of any of them. No prior authorization or registration is required to operate and there are no limits on transferring capital or profits from foreign investments. Uruguay grants several incentives to different types of activities, from industrial to commercial and service activities, intended to be performed in the country. 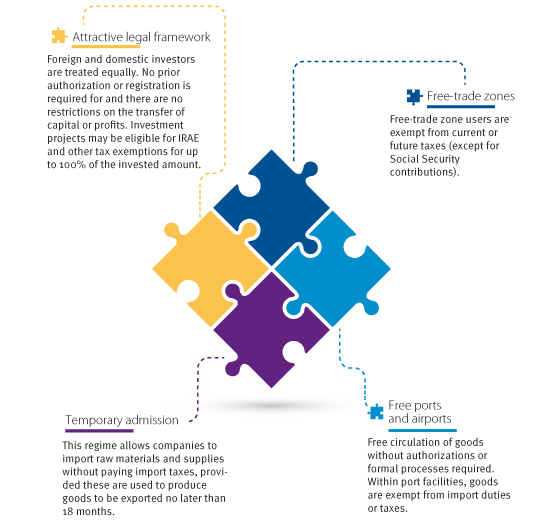 Schemes provided for by the Investment Law, free zones, free port and free airport schemes, public-private partnership agreements, industrial parks and temporary admission are some of the main incentive schemes available in the country. For more information on Uruguayan incentive schemes refer to Investment promotional schemes in our Investor Guide. Uruguay ensures the same treatment to investors and the possibility to operate freely without restrictions on business activities, both in terms of movement of capital and dividends, as well as foreign currency exchange. The country works on providing an appropriate business climate on an ongoing basis and the best facilities for investors. Thus, Uruguay has fostered a number of reforms to materially enhance efficiency and expedite state processes including, but not limited to, Company-in-a-day program, electronic invoicing, electronic signature and international trade one-stop-shop. Uruguay has a top-class port infrastructure in Montevideo, connected to the most dense network of roads across the continent with excellent contacts with neighboring countries. It also has a modern airport, designated as one of the best airports of the world. Uruguayan ports and airports can operate under the free port/free airport scheme, whereby logistics operations, even within value adding and re-exporting processes, can be performed tax free. Uruguay's outstanding infrastructure is also present in the power supply system, one of the most reliable systems in the world, which is mainly sustained by renewable energy. 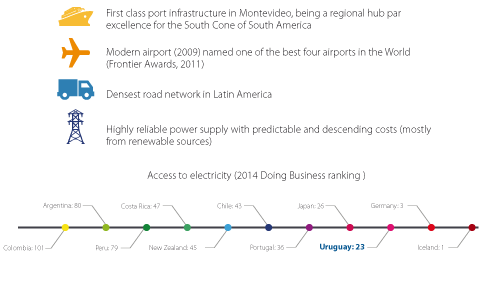 According to Doing Business 2014, Uruguay ranks 23rd above many more developed countries from an economic standpoint. Something similar happens in the Quality of Electricity Supply ranking conducted by the WEF 2013-2014 in which Uruguay ranks first in Latin America due to the very low frequency with which power outages or voltage fluctuations occur. 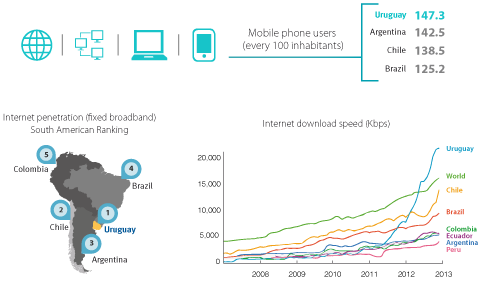 Uruguay has the largest Internet penetration and greatest download speed of the region. 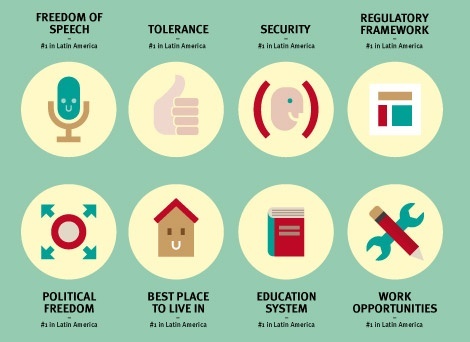 Uruguay is the most advanced country in Latin America according to the International Telecommunication Union's 2014 Information and Communication Technologies (ICT) Development Index. This is also shown by the degree of Internet penetration and by mobile phone users, where our country holds a prominent position in the region. Human Resources in Uruguay are highly competitive due to a combination of several factors, including high quality of basic, technical and university training, flexibility and ease of Uruguayan workers to adapt to new production processes or technologies. The Uruguayan workforce has been showing a steady increase in its ability to master other languages, in particular English. Uruguay has “Uruguay Natural” as country brand, a positioning strategy that involves showing consumers that Uruguayan products have been produced in the most environmentally friendly way. This shows the country's great responsibility for environmental issues and features an added value for many consumers. 50% of the global energy matrix and 90% of the electric matrix in Uruguay will come from renewable energy in 2015, it being the country with the largest share of renewable sources in Latin America. Among other things, this ensures the global stability and sustainability in energy supply and electric bills in the long term. The country is undergoing a process of strong reduction of emissions as a result of the shift in the energy matrix. This, along with other characteristics of the country, derives in products exported by Uruguay causing a low carbon footprint. Montevideo is a peaceful city of 1.5 million inhabitants that, just like Punta del Este, offers excellent living conditions for executives and their families with access to first-class health services and education. More and more foreigners from the northern hemisphere are choosing Uruguay as their place of residence. Montevideo offers the Best Quality of Life in Latin America (Mercer 2014). Residents, whether on business or retired, also enjoy the pleasant climate, the absence of extreme events, the friendly people and a more relaxed and calm pace of life. Uruguay has traditionally had a middle class society, which has been the basis for the educational and social achievements and for its strong social and political stability. Currently, the country has the largest middle class population according to the World Bank and the best income distribution of the region.